This classic Provençal recipe has dozens of variations, all of which pair beautifully with aromatic white Rhône wines like the 2006 Côtes Blanc. The Haas family version below is remarkably simple. 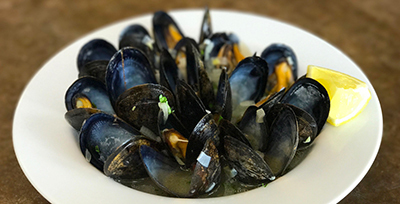 You can vary it by adding a little chopped garlic or some fennel slices along with the shallots, or for a richer version, stir in a few tablespoons of cream or creme fraiche before pouring the broth over the mussels. Clean the mussels carefully, rinsing thoroughly to remove as much sand and grit as possible. Discard any that are already open and do not close when you tap them. Place the shallots in a saucepan with the wine, water, olive oil and salt to taste. Bring the liquid very quickly to a galloping boil, then add the cleaned mussels. Cover the pan for the first few minutes, then uncover and remove the mussels to a heated bowl as they open. To serve, pour the sauce over the mussels, and top with chopped parsley and freshly ground pepper. Serve with crusty bread, and dip the bread into the excess sauce.